One of the first features of the Fritz family of chess playing programs (Fritz, Rybka, Hiarcs, Junior, Shredder) learned by new users is how to manually replay database games by using the keyboard cursor keys or the on-screen VCR buttons. But more than a few folks don’t realize that they can load a database and have Fritz, etc. replay the games automatically, one game after the other, while they sit back and watch. This dialogue lets you set the parameters for “Replay database”; this feature allows you to automatically replay multiple games from a given database. Obviously you’re not going to want to try to watch every game in the 1.5 million game database that ships with Fritz, but you can easily replay all the games from small databases (either ones you’ve created or ones you’ve downloaded) or even a block of games from a huge database. You can double-click on the file name (or single-click on it and then click the “Open” button) to select it. Next we’ll skip down to the “Speed” setting. This controls the length of time between moves in the automatic replay. The lower the “Speed” value, the longer the software pauses between moves; thus “1” is the slowest replay speed while “10” is the fastest. “First game” allows you to pick the point in the database at which the replay will begin. I’ve copied the 45 games from a 2011 Edmonton tournament into a separate database, so I’d naturally pick “1” as the value in this field. However, there are a couple of other cases in which you might wish to select a different value. For example, I might not get through all 45 games of this tournament in one sitting. If I know that the last game I watched was number nineteen in the database, I can pick up where I left off the next time I start Fritz by selecting “20” as the value in this dialogue. Another example might be found when I don’t feel like taking the extra step of copying the games of an event into a separate database. The Edmonton event in question starts with game 4,962,085 in my master database. So I could type “4962085” into the “First game” box to start the automatic replay with that game. Thus there are reasons why you’d start with a game number other than “1”; just be sure to double-check this value before starting the auto-replay to make sure you’re beginning the replay with the game you want. 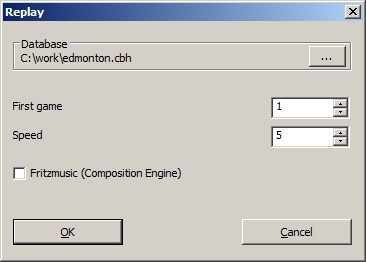 There’s also a check box for those who want to hear Fritz’ midi music files while the games are automatically playing; check it to make the music play. After you’ve made your selections, click “OK” and the game replay sequence will commence, starting from the first move of the game you selected in the “First game” dialogue. Approximately every one to eight seconds (depending on your “Speed” setting) a piece will automatically move on the board, replaying the moves of the game in question and, as usual, the current move will be highlighted in the Notation pane. This button is visible only while the replay is in progress, and the screen will return to the normal menu view once the replay is halted. That’s all there is to it! 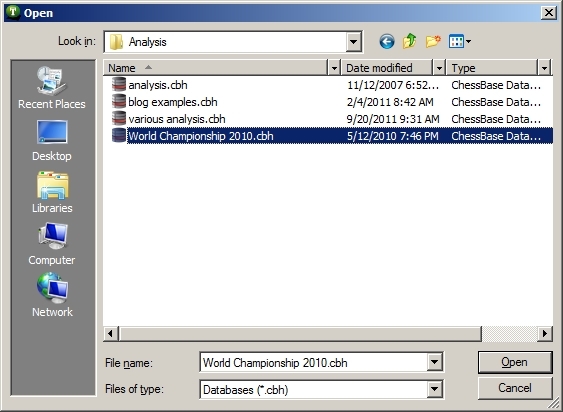 Just click the “Replay database” command, set your parameters, and sit back to enjoy some great chess in the Fritz/Rybka interface!